Improving patient flow in medical facilities and offices across the country is an integral part of providing effective patient care. Since 1993, our unique, reliable and affordable on-site silent patient paging systems have been helping healthcare professionals do just that. With a doctor pager from our range, your medical facility or office staff will have an easy way to improve their workflow and healthcare provision processes. We also offer pharmacy paging devices that help customers know when their prescriptions are ready to be collected – these are an excellent addition to any hospital paging systems, if your pharmacy is attached to a hospital facility. Our hospital paging products also help reduce overhead and maintain patient confidentiality. We can offer a doctor pager that is totally silent, helps medical staff (doctor or nurse) get to patients that need attention quickly and doesn’t disrupt the atmosphere of your hospital. We even offer an electronic survey system that will help you collect and study patient metrics so you can improve your patient flow even more. 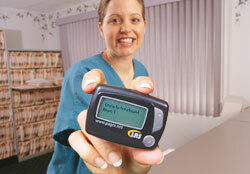 Use the link on this page to get yourself a free quote on one of our pharmacy paging or hospital paging systems.